Currently my youngest grandson is fascinated by all things to do with Thomas the Tank Engine. This week we visited a shop which specialises in this merchandise as well as several other very popular brands such as Peppa Pig and Brio. 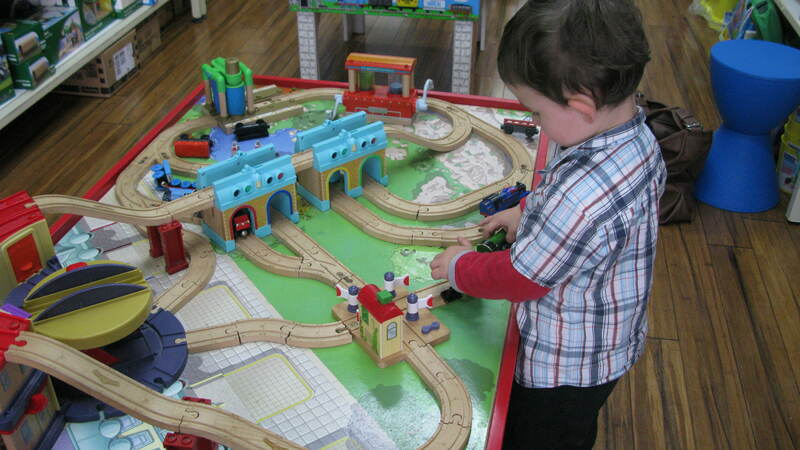 The purpose was not to make a purchase but to play at the tables set up with toy trains. It seems to me to be a very good marketing move as at the rear of the store there are chairs and stools for parents and carers to use as their charges play happily at the various configurations on several tables. Then, to make it even better, one can buy a proper coffee and cookie or biscuit to enjoy. The day we were there, several groups of Mums were enjoying a catchup while their pre-schoolers and toddlers played happily. Happy kids and happy Mums! My grandson and I spent an hour and a half playing together before going home for lunch. A great shared outing.